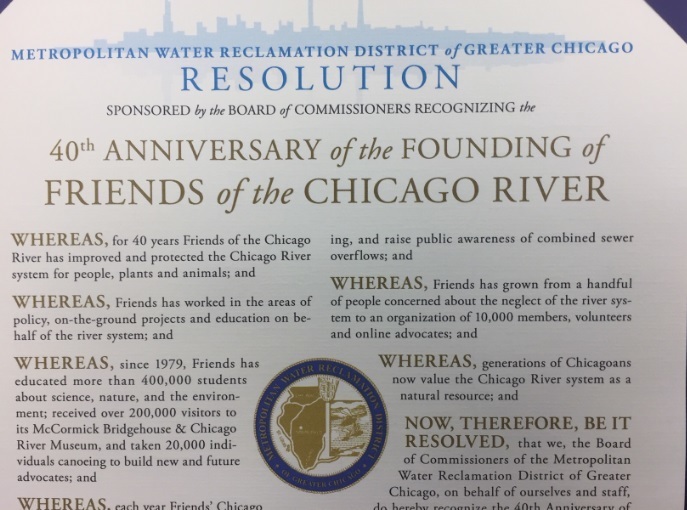 Friends of the Chicago River was recognized April 4 for its 40 years of work on behalf of the Chicago River system by Metropolitan Water Reclamation District Commissioner Mariyana Spyropoulos, who congratulated our efforts. Spyropoulos worked with Friends to launch Overflow Action Days. "Friends has grown from a handful of people concerned about the neglect of the river system to an organization of 10,000 members, volunteers and online advocates," according to a resolution passed by the MWRD board. "Generations of Chicagoans now value the Chicago River system as a natural resource." "Without your advocacy and without the efforts of the water reclamation district we would not have as many fish species, bird species, and turtles living and thriving in the Chicago River," said Shore. "I know we have a lot more to do and I look forward to doing it with you in partnership." "Friends of the Chicago River deserves all of our respect not only in this room but throughout Cook County," added Commissioner Cam Davis. The resolution was accepted on behalf of Friends by executive director Margaret Frisbie. "Over the years, with the district, with the forest preserves, with the park district, with community groups, with volunteers, with students, with teachers, we have transformed the Chicago River," said Frisbie. "Success can be measured in miles of trails, in species of fish, and in literally tens of thousands of people who are in, on, and along the water every single year. These are numbers that were unimaginable in 1979. "I am proud to be part of a legacy of people who could see past fences, see past sewage, see past things that seemed insurmountable. We all need to work together. We all want the river to be clean, the river to be healthy and for all of us to be swimming in it someday," Frisbie said. Read more about the history of Friends here. 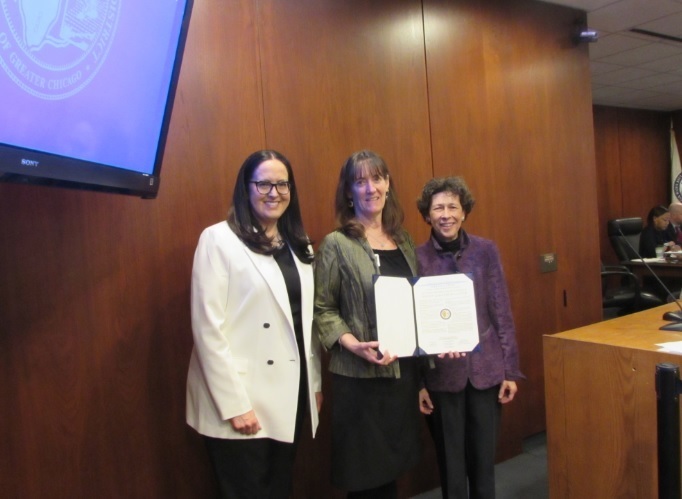 Metropolitan Water Reclamation District Commissioner Mariyana Spyropoulos, Friends Executive Director Margaret Frisbie, and MWRD commissioner Debra Shore.